This first appeared at St Peter & St Paul in 1878. Initially it consisted of a localised cover and one page of local news wrapped round 24 pages of a religious insert called Home Words. It cost one old penny per issue. At the end of the year you could have your twelve copies bound into a handsome blue and gold embossed hard-cover binding. A few of these volumes still exist in the village. 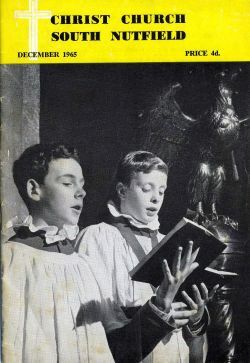 The St Peter & St Paul magazine continued in various guises until 2005. In the 1939-45 war it shrank to a single duplicated sheet. The magazines of the last 50 years, coinciding with the Revd Graham Williams term as rector, have been bound, and are kept at the church. 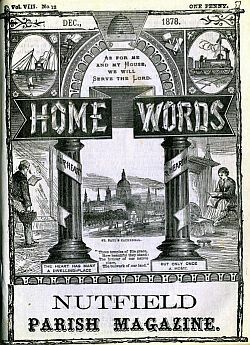 At Christ Church, which was built and consecrated in 1888, Home Words was introduced in 1904, again with a localised cover and a page of local news. Katherine Fison, wife of the first vicar, kept the local pages for the period up to his death on Armistice Day, 1926, and a little after. These pages were bound into one volume, January 1904 - February 1927, which is in the possession of Nutfield History Group. 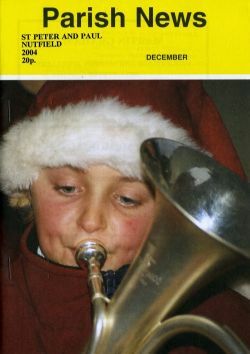 This magazine continued, in a variety of formats, until December 1973, when it gave way to the Link.